Distributor: R1 DVD from Bandai Entertainment, also available streaming on Crunchyroll. Notes: This is an alternate-universe Gundam series, and is not set in the main Gundam universe. The year is Future Century 60. The various countries of Earth have developed space colonies on which the elite dwell. To avoid war, a Gundam Fight Tournament is held every four years to determine the next temporary ruler of the Earth sphere. This year marks the beginning of the 13th Gundam Fight Tournament. But this year's tournament is different from its predecessors. An experimental nanotechnological beast called the Devil Gundam is on the loose and it is the duty of Domon Kasshu, Neo-Japan's Gundam fighter, to participate in the Gundam competition, eliminate the Devil Gundam, and clear his family name. To those not in the know, Mobile Fighter G Gundam was the first alternate universe (AU for short) Gundam series, preceding AU shows such as Gundam Wing, Gundam X, and the currently airing Gundam Seed. Until G Gundam's arrival in 1994, the Gundam narrative was composed exclusively within the Universal Century (UC for short) universe. This was the same universe and timeline in which the characters of Mobile Suit Gundam (the original Gundam series), such as Amuro Rey and Char Aznable, existed. 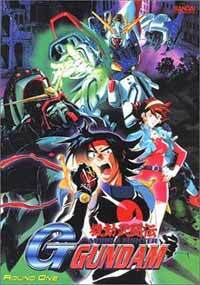 G Gundam then was a bit experimental, considering the history and tradition of the Gundam franchise until that period. Without any firm precedent, save for certain distinctive physical features of the mecha in the UC universe, G Gundam boldly disregarded the conventions of its predecessors and charted new territory in an already firmly established continuity. It did so with decidedly mixed results. The first thing one is bound to notice with Mobile Fighter G Gundam is its stylistic uniqueness. For instance, in years prior most Gundam mecha had the same basic color scheme and general appearance. However, with the release of G Gundam we are finally treated to Gundam mecha of greater variety in terms of both design and color format. Structurally the mechanical robots seem to reflect the characteristics of the individual Gundam fighters that pilot them as well as the country of their origin (of which Mexico's Tequila Gundam - renamed Spike Gundam in the dub - is a humorous, if politically incorrect example). With so varied a design basis it is unsurprising and refreshing that we see such heterogeneity in the look and ability of the individual Gundams. This variety often manifests itself in very distinctive special attacks and Gundam battle sequences that don't look dissimilar to the mechanics employed in most fight-style anime, although the frequency with which some of these special attacks are used gets a little trying the further one progresses into the series. In addition, the Gundam fighters themselves are also rather stylized and distinctive, although sometimes a bit boring. They come from an immense range of backgrounds and circumstances and are all reasonably complex when considering G Gundam's primary tool for advancing an already not-so-thick plot, namely a constant succession of battles. What are most characteristic about each fighter, however, is their individual motivations for participating in the various Gundam fights that eventually culminate in the Gundam Fight Tournament. For George de Sand the battles present an opportunity for him to bring honor to his home country of France. For Chibodee Crocket the tournament is a means to bring hope to his hometown of New York City. And so on. In fact, the compelling motivations of each of the players involved are what give them much of their dynamic appeal. Again, the only protruding weakness in characterization is that actors are occasionally unexciting, whether due to stale dialogue or some other semi-minor unquantifiable reason. In terms of animation and musical soundscape, this series manages to get the job done, if barely. At times the animation is quite nice, while at other times it is below average. Most often though the visual quality straddles the middle ground as mostly adequate and generally non-distracting. The same holds true for the musical backdrop as well. It is mostly OK. However, I can't help but believe that a better job could have been done both visually and musically considering the quality of other animated features and series from the same time period and the fact that some of its Gundam series predecessors were of a higher quality level than this piece itself. For all its success in providing reasonably decent characterization and remarkably fresh styling, as well as somewhat capable music and visuals, the most profound weakness of G Gundam comes in probably the most vital area: plot. The narrative exists predominately to move the viewer from fight to fight and to gradually increase the strength and fighting ability of the show's leads. While this is not at all uncommon in most anime of the fight-style genre, it is surprising in a show whose predecessors focused so tirelessly on powerful and moving story lines. By making the focus of Mobile Fighter G Gundam its battle scenes, the obligatory fight displays that are strewn throughout all Gundam series become the plot's end rather than just a means, and consequently the other more potent plot elements, such as the tension between Domon and his teacher Master Asia or the romance between Domon and Rain Mikamura, were de-emphasized. And perhaps the plot of this piece should be structured around physical struggle. Nevertheless, this specific scenario required more padding with respect to its other thematic situations. This story line did have potential, but it simply got overshadowed from start to finale by the show's domineering, if repetitive action sets. Overall this show is generally painted as horrible, the worst Gundam series in existence. This is a designation that I believe to be by and far unjustified. While this title does have several major and minor flaws, G Gundam always manages at a minimum to be fun, which is more than I can say for some of the newer AU Gundam anime. It isn't inspiring but it is diversionary and totally watchable, as long as you can overlook the fact that endless battle sets often take the place of a plot. For fans of fighting-genre anime that find themselves partial to fancy mecha, this will be utopia. The final verdict: a not-so-bad title that, while not revolutionary, at least manages to step ever so slightly in the right direction. Recommended Audience: Nothing remotely indecent. The only objectionable content comes in the form of some not so realistic fighting between giant robots. Any ten year-old would be safe with this title.